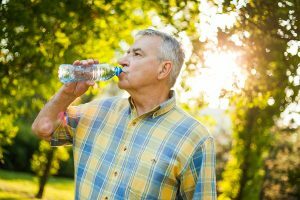 You’re probably not going to be surprised to hear that older adults need to stay hydrated to remain healthy. After all, about 60 percent of the human body is made up of water. Though even the Centers for Disease Control and Prevention (CDC) says that water may be best, statistics show that the average adult only drinks about 39 ounces of water per day. That’s far less than the 64 ounces (8 glasses) per day that most doctors recommend. There are a lot of reasons your aging relative needs to drink plenty of water. Now, a new study indicates that helping them get the brain health benefits of exercise may be another reason. Researchers recently presented a study at the American Physiological Society’s annual meeting concerning the effects adequate water consumption and exercise have on the brain. The researchers were interested in the subject because they knew many older adults aren’t sufficiently hydrated, partly because they often don’t feel thirsty the same way that younger people do. Previous studies had shown a link between hydration, brain function, and exercise performance, but none had studied the effects in older adults. To test their theories, the researchers tested bicyclists with an average age of 55 who were participating in a cycling event that took place on a day when the weather was warm. Before the event started, the researchers performed tests and placed each person into one of two groups—those who were dehydrated and those who were not. Participants also took part in a mental test before and after the ride. Those who were hydrated improved their time on the test after the ride. Those who were dehydrated didn’t improve much at all. The results of the study suggest that to get the most brain boosting benefits from exercise, older adults need to drink plenty of liquids throughout the day. How Home Care Can Increase a Senior’s Liquid Intake. Because seniors have a lesser ability to recognize when they are thirsty, they often fail to drink enough liquids. Home care can help them to get more liquids throughout the day. A home care provider can keep a bottle of fresh water close to the senior during the day, refilling or refreshing it when needed. Home care providers can also offer foods that contain more liquid, such as watermelon or soup. If the older adult prefers flavored drinks, a home care provider can make infused water with fruit or cucumbers to improve the taste. If you or an aging loved-one are considering professional home care in Columbia, MD, please call the caring staff at Global Hands Inc. Call today 240-264-0769. Dr. Andrina is the Executive Director of Global Hands Inc. and has over 17 years of business finance experience and entrepreneurship. Dr. Andrina worked and also volunteered for many years with healthcare service provider agencies that support individuals with intellectual and developmental disabilities in Maryland. She has a BBA, MSPM, & MBA from University of Maryland and an earned doctorate degree from Walden University. Dr. Andrina is married and has 2 children. Today Dr. Andrina’s skills and experience are applied in her leading of all aspects of person-centered and person-directed approach provided by Global Hands Inc., assuring that the management of the organization remains committed to promoting quality care, safety, dignity, and independence of individuals served. This entry was posted in Dehydration, Health Issues, Home Care in Columbia MD and tagged Home Care in Columbia MD. Bookmark the permalink.